This post has also been re-published by The Guardian. The British newspaper/tabloid The Dail Mail and its writer David Rose are notorious for publishing misleading (at best) climate-related articles, as we have discussed previously here, for example. They have recently struck again, claiming that according to a "quietly released" Met Office report, global warming stopped 16 years ago (a myth which Skeptical Science debunks here and here). This assertion is entirely fabricated, as the Met Office explained by publishing David Rose's inquiry and the Met Office's responses. "Firstly, the Met Office has not issued a report on this issue. We can only assume the article is referring to the completion of work to update the HadCRUT4 global temperature dataset compiled by ourselves and the University of East Anglia’s Climate Research Unit. We announced that this work was going on in March and it was finished this week. You can see the HadCRUT4 website here." Rose's factually challenged article was predictably reproduced uncritically by the usual climate denial blogs and referenced by Fox News, perhaps in an attempt to distract from this year's record-breaking Arctic sea ice minimum. However, virtually every point made in the article was factually incorrect, as Rose would have known if he were a Skeptical Science reader, because we recently pre-bunked his piece. "First, please confirm that they do indeed reveal no warming trend since 1997." The Skeptical Science temperature trend calculator can be used to test this question. The trend in the HadCRUT4 global surface temperature dataset since 1997 is 0.084 ± 0.152°C per decade (although we have not yet updated the HadCRUT4 data, the GISS and NCDC datasts show a similar warming trend since 1997). While the trend is not statistically significant, the central value is positive, meaning the average surface temperature has most likely warmed over this period. The Met Office also explained that Rose is essentially trying to go down the up escalator (Figure 1) by focusing on short-term noise while ignoring the long-term trend. "Over the last 140 years global surface temperatures have risen by about 0.8ºC. However, within this record there have been several periods lasting a decade or more during which temperatures have risen very slowly or cooled. The current period of reduced warming is not unprecedented and 15 year long periods are not unusual." Figure 1: BEST land-only surface temperature data (green) with linear trends applied to the timeframes 1973 to 1980, 1980 to 1988, 1988 to 1995, 1995 to 2001, 1998 to 2005, 2002 to 2010 (blue), and 1973 to 2010 (red). Perhaps most importantly, focusing on surface air temperatures misses more than 90% of the overall warming of the planet (Figure 2). "The new data confirms the existence of a pause in global warming"
However, this claim is simply incorrect. Nuccitelli et al. 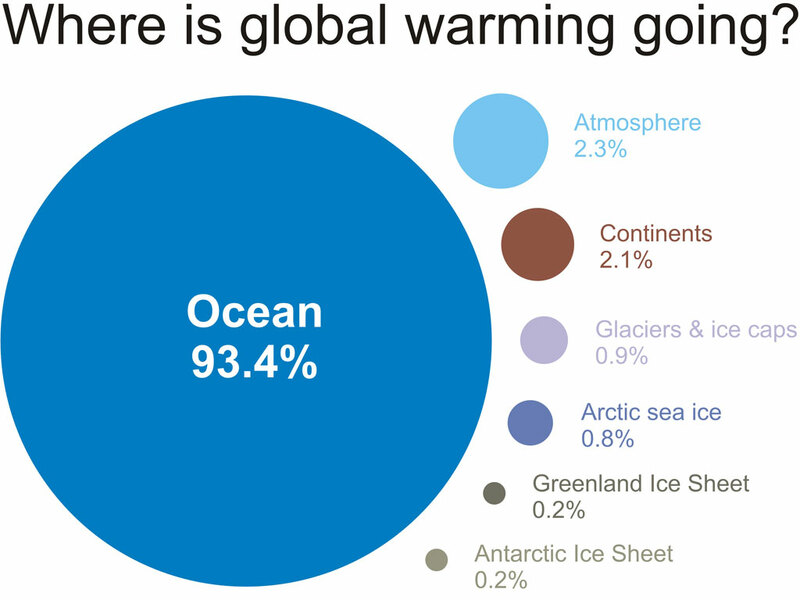 (2012) considered the warming of the oceans (both shallow and deep), land, atmosphere, and ice, and showed that global warming has not slowed in recent years (Figure 3). Were Rose and Curry Skeptical Science readers, they would have known several days prior to the publication of this article that the claim about global warming "pausing" in 1997 was pre-bunked by Nuccitelli et al., as Figure 3 clearly shows. "Natural variability has been shown over the past two decades to have a magnitude that dominates the greenhouse warming effect"
This statement is also incorrect. There is always a point at which, as long as one only considers sufficiently short timeframes, a long-term signal will be smaller than the noise in the system, which appears to be Curry's argument here. However, for global surface temperatures, that timeframe is less than the two decades Curry specified in this quote. Even ignoring 90+% of global warming and only considering global surface temperatures, they have warmed 0.4°C over the past two decades, according to HadCRUT4. Swanson et al. (2009) examined the role of natural variability on global surface temperatures and found that it rarely exceeds 0.2–0.3°C, and averages out to approximately zero over longer timeframes (Figure 4). Thus Curry is incorrect; even over a timeframe as short as the past two decades, the human-caused global surface warming signal has been larger than the natural variability of the global climate system. And when we consider the warming of the planet as a whole (including the oceans), the warming signal is very clearly larger than the noise over this timeframe, as Figure 3 shows. "Professor Judith Curry...told The Mail on Sunday that it was clear that the computer models used to predict future warming were ‘deeply flawed’"
Rose and Curry are trying to argue that because global surface temperatures have not warmed as fast as the multi-model average in the IPCC report (0.2°C per decade), this somehow suggests the models are flawed. However, the Met Office explained to Rose (prior to the publication of his article) why this notion is incorrect. "The models exhibit large variations in the rate of warming from year to year and over a decade, owing to climate variations such as ENSO, the Atlantic Multi-Decadal Oscillation and Pacific Decadal Oscillation. So in that sense, such a period is not unexpected. It is not uncommon in the simulations for these periods to last up to 15 years, but longer periods are unlikely." Over the past decade, aerosol emissions (which cause cooling by blocking sunlight) have risen, solar activity has been low, there has been a preponderance of La Niña events (which also cause short-term surface cooling), and heat has accumulated in the deep oceans. Thus it is entirely unsurprising that these short-term effects all aligning in the cooling direction in recent years have offset much of the surface warming caused by human greenhouse gas emissions. This result is in fact consistent with individual climate model runs. Meehl et al. 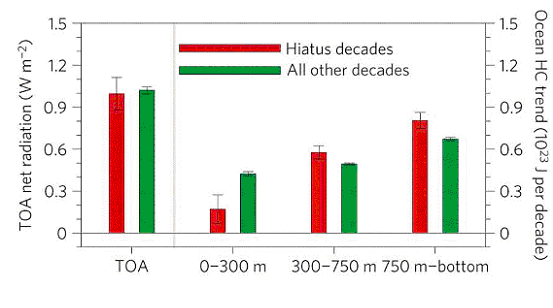 (2011) showed that during "Hiatus Decades," there is less warming of the surface air and shallow oceans, and more warming of the deeper oceans (Figure 5), precisely as we have observed over the past decade. All of these misleading claims lead to Rose's ultimate argument in attacking carbon pricing and investments in green energy. "And with the country committed by Act of Parliament to reducing CO2 by 80 per cent by 2050, a project that will cost hundreds of billions, the news that the world has got no warmer for the past 16 years comes as something of a shock...the evidence is beginning to suggest that it may be happening much slower than the catastrophists have claimed – a conclusion with enormous policy implications." To sum up, Rose and Curry were simply incorrect in virtually every assertion made in this Daily Mail article. The slowed rate of global surface warming over the past decade is consistent with individual model runs, which show that these 'hiatus decades' are entirely expected. 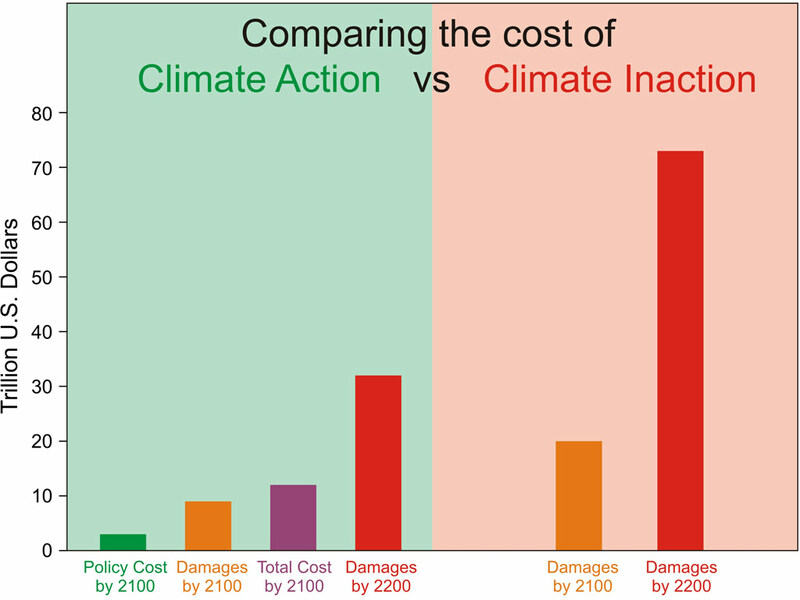 Carbon pricing will result in a net benefit the economy as compared to doing nothing and trying to adapt to the consequences. Also see debunkings of the Rose Daily Mail piece by Climate Progress, Carbon Brief, Potholer, and Media Matters. I started this last night knowing that someone was going to post....thanks Dana. Recently SKS has posted a number of quality articles on the issue of climate change communication-CCC. One aspect of CCC that keeps showing itself over and over is the misdirection of obfuscation as offered by those who, for whatever reason, feel the need to take their skepticism out of the realm of reason and logic and into the dark shadows of rhetorical excess and blatant misrepresentation. An article by David Rose from the Daily Mail Online is an excellent example of this and a focused dissection will give us the opportunity to examine a few of the techniques that are commonly used. The reader will be best served by opening the article in another window and placing it side by side; think of this as SKS-CSI: CCC Squad. Starting with the headline we are introduced to an unnamed report, one that the Met Office has said they did not release or produce, and a sinister suggestion that it was quietly release as thought there is something to hide. This point of a quite release is going to show up a few times in the article. Though the writer never talks about the origin of this report it is repeatedly implied that the Met Office is responsible. Next, we get two bullet points; one that stipulates a time frame statistically irrelevant, and the second that draws a conclusion only the writer knows the significance of but when used as a bullet point it must be important. The opening sentence is nothing more than a repetition of the primary statistical outlier dressed up as relevant information and to those who don’t know any better it will carry the weigh of fact; that the writer and editor chose to place this as the opening sentence adds to the perception of importance that the information doesn’t merit. The second sentence introduces the concept of “debate” within the climate science community without introducing these other voices; later we will hear one voice who disagrees but the controversy from that voice has nothing to do with the “report”. This is a created controversy that does not actually exist within the science community but serves the writers obfuscation. No scientist who works with the data or understands the nature of statistics is going to accept this time frame as anything more than noise. It is this degree of sophistry and speciosity that can alter the public perception away from the generally accepted message as generated by science toward a false perception of our actual climatic status based on nothing more than manipulative articles like this. Sentence three and the writer is offering a conclusion as to the meaning of this “report” albeit a conclusion that is again irrelevant and based on statistical noise that no scientist would accept as note worthy. Next we get a graph produced by the Mail that has the requisite amount of fire engine red to demand the viewer’s attention with just the right mix of deception in structure to look as thought it supports the articles central premise. Not only does the writer apply his own biased analysis to the “report” but he avoids any of the graphics from the “report” and has his people make their own. Note that the graph title makes a suggestion the graph never shows; “showing tenths of a degree above and below”, there are no points on the graph below, but the seed has been planted in the readers sub-consciousness. At this juncture it is evident that journalistic integrity and objective reporting are not what we are going to find. A line by line autopsy will not tell us much more than we have already discovered so let’s look at just some broad strokes. There is the repeated mentioning of the “report” being quietly released with the implication that in comparison to the “media fanfare” of the previous release of temperature data there must be a reason that implies that the devil is afoot. Reading further we get to meet a few of the popular memes that have been making the rounds such as: catastrophic, bourgeois Left-wing academics (a new one for me but one that I find most entertaining), another repeat of the articles primary focus but this time in the form of a pub trivia game (an appeal to populist working class? ), still another repeat of the report being issued “quietly” in comparison to…; and then the monster who eats little babies, “Your energy bill is going to increase”. It should be noted that whenever reason and logic fail suggest someone has their hand in your pocket and is stealing from you to make your point unassailable. This article isn’t about science as it only skims the data, albeit incorrectly, this article is just another salvo in the war for the minds of the masses who are either to busy to notice of lack the sophistication to discern the high degree of sophistry being applied. This is about using a dishonesty of words to manipulate emotions in the reader who lacks the intellect to see the obvious propaganda. Maybe the motivation is pure business, trying to appeal to the readerships demographic. Regardless of the reasons for this article, the substance is appallingly misleading noise. The daily mail article was linked on NZ's Whaleoil blog. It prompted me to download the HADCRUT4 monthly data and make my own graph. You can see my comment and graph here. The mail online had chosen to start their graph with the September 1997 figure, .475 degrees. The January 1997 figure is about .2 degrees so would have given the impression of an overall .3 degree rise through to May 2012. Of course nowhere does the mail online cop to only including the last 4 months of 1997's data. "Regardless of the reasons for this article, the substance is appallingly misleading noise." I agree--nothing but noise from a radical, anti-science minority, it is all they have. It is bad enough that certain "journalists" habitually misrepresent the science and fabricate falsehoods. But what is much worse, in my opinion, is when you have a (formerly) respected scientist (i.e., Curry) enabling Rose while full-knowing the long dubious history of said "journalist". This is wholly unacceptable, and tragic that such repeated unprofessional behaviour goes without consequence. Not surprisingly, the usual fake skeptics out there have been only too happy to uncritically disseminate this propaganda. Google the title and you will quickly see the usual suspects pop up on the radar. This article is an excellent example of the concept of meme in regards to the disinformation of Availability cascade. Keep repeating until the noise drowns out reality. This article is disgusting not only as it is viewed in relationship to climate science and understanding but in regards to the state of affairs in the world of journalism. Yes, the usual suspects for sure. The denial propaganda machine is doing whatever it can to try and drown out the inconvenient truths such as the dramatic loss of Arctic sea ice and continuation of anthropogenic global warming. "Keep repeating until the noise drowns out reality." Agreed. This duo by Rose and Curry is clearly designed to drown out reality and help fake skeptics deal with their denial and cognitive dissonance. "....but in regards to the state of affairs in the world of journalism." This is a pretty sad time for journalism. Good and ethical journalists should be outing Rose and giving him a piece of their minds. But will they have the fortitude to call out one of their own? It is their loss and another hit on their profession if they don't. Curry has consistently argued that a great deal of the increase we have seen (not to mention melting ice in the Arctic) may be attributable to the AMO and the PDO. These are convenient because the AMO in particular goes for multiple decades so even 30 years of increase can still be attributed to them. I haven't seen any analytic work by either Curry or anyone else to substantiate this hypothesis. Of course her claim for a pause in the warming ignores the fact that when you correct for TSI, ENSO and aerosols there has been a steady increase - and as you say there is the small matter of ocean warming. BTW, there's something a little off in the escalator. The last data point shows up with an odd dip before disappearing for the red trend. As it's a good graph against all these "it hasn't warmed since YYYY" and I would've loved to link to that, but in its current state the animation potentially might raise some redundant questions from a certain crowd. Thankfully, Dave Britton handled the denialist comments in the met office response amicably. The Daily Mail has been appropriately described as "Britain's answer to Fox News". It's depressing how an apparently serious newspaper prints such garbage. I don't see any big complication in understanding that a linear trend overlaid on short-term cyclic variation can occasionally result in a "flat" or even "negative" short-term trend. A really simple thing to do is to create a plot of a sine wave added to a linear function (e.g. y = sinx + 0.1x will give periods of about 3 units where the curve goes down) and on a sufficiently small time scale, the trend appears reversed, or do what I did here: take a period when the temperature record is flat, add a positive linear trend, and you will still find periods when there is a negative slope on a trend line. In all cases, you know there's a linear trend because you've imposed one on data that had no trend before. Your critique has been explained in this post. Particularly in comment 2, Dana explains that the "dip" is due to incomplete BEST data from 2011, that "skeptics" like to cherry-pick to support their preconceptions, wheareas in the realist view, BEST series was extended with all available data for 2011 (at that time). Was it a good choice to illustrate this denialist meme? It is a matter of opinion. My opinion is that it was good, as we've seen example of such data cherying/distorting by denialists in the past. I was waiting for this debunk to inform my comments on HuffPo. Its climate section has been inundated by Daily Mailites. I love the denier / realist gif. This distortion of the Met Office HadCRUT4 data will I'm afraid be a powerful denialist tool. Complexity is the enemy in the Daily Mail's / WUWT world of automatic gainsay. I computed a linear trend with Excell and the outcome is 0.06 per decade (not 0.084). As far as I can see the trend calculator seem to miss some points at the end of the series? But what is much worse, in my opinion, is when you have a (formerly) respected scientist (i.e., Curry) enabling Rose while full-knowing the long dubious history of said "journalist". She claimed she had been misquoted by David Rose last year as well. In fact she said: "At the moment, I’m feeling manipulated by both Rose and BEST." Bart: My fault. Updated data for all the series, including new versions of HadCRUT4, BEST and UAH on their way to John. Unfortunately we never got round to automating the updates. I am so grateful for this article. Here in the UK there is a growing backlash against wind turbines and the article was skewed to imply that growing energy prices were the result of green energy, which I don't believe to be accurate. With 'respected' papers like the Mail printing nonsense - no wonder we have UKIP printing policy documents like this one. Please - is there someone at SKS who would be kind enough to help me write an objective scientific response to this policy document? Cornelius I think the increase in prices is due to a number of factors, including low carbon energy and grid investment etc. but not solely. The 15% figure for renewable energy is often a misquoted and mis-used one. It applies to ALL energy use, not just electricity generation. It was (mis)used by Chris-Heaton Smith in his campaign to get MP support to stop/reduce wind farm installations. I think it is estimated that around 30% of UK electricity will have to be produced from renewables to obtain a 15% overall renewable energy portfolio by 2020. Renewables currently (in Q1 of 2012) account for about 11% of electricity generation, that is all electricity generation renewables, not just wind turbines. The spinning reserve thing quoted for gas turbines I would say is incorrect, such a turbine probably only takes about 15 minutes or so to run up. Much of this issue is in designing systems. In any case there are some good energy storage systems being developed now that have a lot of potential, use cheap abundant materials and don't depend on batteries. The keep the 'wheels of industry' turning bit is amusing considering most of it has been exported to China et al! UKIP twist the purpose of the current renewables plans. Current renewables installation is to offset established fossil fuel electrcity generation, so inevitably you are still going to have fossil fuel generators as well. What they are doing is assuming that the current plan is to shut down fossil fuel plants on a like for like basis. Some of that will happen but the goal is to cut CO2, not to take plants offline. The bigger issue is later when we need to have a higher percentage of low carbon energy. But that's when the new energy storage and smart technology will kick in and we will need fewer fossil fuel fired power stations. Neven @ 13 - Wasn't Dr. Curry also "misquoted" during the recent PBS NewsHour dustup? It could all trace back to the same original quote, but if she is honestly having that much trouble getting her point across, you would think she may try a different approach. Many thanks for the article Dana, certainly helps me take the battle to the committed misinformers on the CBC. It seems like something Watts would imply, but with a little more finesse I suppose. ".. fairness to Professor Curry she does claim that she has been misquoted "
That would ordinarily be a reasonable assumption. But there is a history here that suggests something else is going. Just under a year ago, BEST released their results and the fake skeptics were up in arms because the BEST results corroborated the warming in the land surface temperature record that climate scientists had been telling us about all along. "Judith Curry protests that she was misrepresented by the article in the Daily Mail, and several readers have mentioned that David Rose, the author of the article, is just the man to do such a thing." One has to wonder then why on earth Curry would elect to give Rose another interview given her recent experience with him? Oddly, Curry is again claiming that she has been misrepresented. So much back-peddling by CUrry, but in the meantime the horse has bolted around media outlets sympathetic to fake skeptics. Why would anyone again speak to a journalist a) who is infamous for misrepresenting people, and b) who has misrepresented you in the past? Now Dr. Curry is not that gullible. No, something else is going on here, and I'm sure that astute readers can figure it out. "Curry has consistently argued that a great deal of the increase we have seen (not to mention melting ice in the Arctic) may be attributable to the AMO and the PDO..."
Yes it is very convenient, especially if one wishes to obfuscate. A blog post in the next day or two will speak to this myth. The fact of the matter is that researchers estimate that anything from 60-90% of the recent ice decline is attributable to anthropogenic warming. Additionally, other research has shown that the current loss of Arctic ice is unprecedented on a millennial time scale (e.g., Polyak et al. 2010, Kinnard et al. 2012). Both those papers are covered at SkS here. It is also odd that Curry appears to be of the opinion that uncertainty is always skewed in the direction of lower climate sensitivity, yet at the same time she argues that the same models with a climate sensitivity of 1.5 to 4.5 C global warming for doubling of CO2 are deeply flawed because they are underestimating the loss of warming. How can models that are underestimating the loss of Arctic sea ice and sea-level rise at the same time be claimed to be too sensitive to the doubling of 2xCO2? So the internal inconsistency of this argument is obvious, as it is with most of the arguments made by "skeptics". "It has been a truth long acknowledged by climate sceptics, deniers and realists of every conceivable hue that since the mid-19th century, the planet has been on a warming trend..."
Fast forward to present and now the fake skeptics have reverted to recycling another old favourite myth of "no warming in X years", with suggestions that the UK Met. Office is trying to hide something thrown in for good measure. This is beyond a joke. Do they really think that people are so obtuse as to not keep track of such things? It is insulting and the public should be outraged that some "skeptic" scientists and media outlets are so intent on continually misleading and confusing them on this issue that is of utmost importance. This sad saga yet again demonstrates the inability of fake skeptics to mount a coherent, internally consistent and credible argument against the theory of AGW. What is especially egregious though is that a "skeptic" scientist is enabling them. I have zero sympathy for Curry here. Rose is notorious for distorting climate science in every article he writes on the issue, and as others have noted, Curry herself claims to have been misrepresented by Rose in the past. Maybe she should learn from these experiences and stop granting him interviews, because he clearly views her as an easy target to support his climate denial. This might be useful to you. Infographic: What puts up your energy bill? Interesting graphic and article JR.
Good to see you in the UK Guardian . Poor 'ShuffledCarrot'is still confused about what Phil Jones said about temperatures it would seem. I don't think Judith will be much pleased with that picture either. Thanks for the heads-up Lionel. It's always a pleasant surprise when The Guardian reposts our stuff! I have one question, looking at the figure 2 I see that the heat content of the atmosphere is 2.3%, based on a period of 10 years. Table 2 in Church et al 2011 gives 2.0/207.2 = 1.0% for the atmosphere over a longer period 1972-2008. Would it not be better to use the Church data? Albatross: "Do they really think that people are so obtuse as to not keep track of such things?" Yes, they do. They depend on it. If people had the time, energy, training, and/or means to fact check, opinion-makers like Rose and Watts would be doing something honest for a living. In general, it's not deliberate stupidity. It's just a lot of work to get to a point where one can be confident about the basis of one's beliefs. I'd argue that in the eyes of most people, Rose appears at least as trustworthy as government-supported scientists -- not very trustworthy. How many people have read Rose and followed up by going to the Met Office blog? How many then went to verify from a third party. And so on . . . ? "Curry herself claims to have been misrepresented by Rose in the past. Maybe she should learn from these experiences and stop granting him interviews, because he clearly views her as an easy target to support his climate denial." But when asked Curry writes: "Re David Rose, he is writing thought provoking articles, even if I don’t agree with everything he says. I enjoy my conversations with him." I'm sorry, I think she enjoys being a target. (-snip-). The focus should be on getting accurate, unbiased results that will provide a solid base for future planning in regard to combating climate change. Moderator Response: [DB] Ideology snipped. SA Dean, Jennyg, please refer to the Comments Policy before posting further. Sock puppetry is "frowned upon, in this establishment". JosHag @28 - the IPCC (the basis of Figure 2) is the gold standard review of the best scientific literature to date, so it's hard to go wrong using that as your basis. Church does great work, but his is just one study, whereas the IPCC is a review of the body of literature. Neven @30 - wow, Curry calling Rose "thought provoking". That's rather appalling. More like thought diminishing. Curry has consistently argued that a great deal of the increase we have seen (not to mention melting ice in the Arctic) may be attributable to the AMO and the PDO. These are convenient because the AMO in particular goes for multiple decades so even 30 years of increase can still be attributed to them. I'm intrigued by this; surely for any kind of oscillation to increase (say) global surface temperatures, then some other part of the planetary system must be cooling: if it isn't then its not an oscillation of heat at all. Does Curry have a candidate for this - or is it just waffle ? DB, are you suggesting that SA Dean returned with a mask? Apparently, like potato chips, one was not enough. But in the end, there can be only one. What on earth is a 'fake skeptic'?? "Use this as an opportunity to communicate honestly with the public about what we know and what we don’t know about climate change. Take a lesson from these other scientists that acknowledge the ‘pause’, mentioned in my previous post (Candid comments from global warming scientists)"
She goes on to quote Trenberth, Hansen and other prominent Scientists/activists who have acknowledged the 'pause'. hank @36 - yes, I read Curry's post and was impressed that she criticized me as 'needing to raise the level of my game' while herself managing to ignore nearly all of the points that I made in my post. She focuses entirely on the one point in Rose's article that's almost technically correct - that global surface temperatures have been pretty flat over the past 15 years, ignoring the fact that he wrongly equates this with "global warming" - manages to miss the point that I already acknowledged that the warming of surface temperatures has slowed (and discussed why that happened), ignores the fact that global warming has continued as measured by global heat content, etc. etc. I'll put it kindly and say I was not impressed by Curry's response. If you want to know specifically what I think about Curry's post, I posted comments here and here. But I doubt I'll waste much more time there, because I feel as though I'm arguing with somebody who's criticizing an article she didn't even bother to read/understand. A "fake skeptic" is a person who is skeptical about anything they dont like but laps up anything they like without switching on any critical faculty at all. This is frankly normal human behavior but a decent science education should give a person the tools to avoid it (esp the scientific method). A true skeptic critically examines all evidence (eg most working scientists). Thank you. I will be composing a response to the UKIP policy document and may ask again for help with a review. The first thing I noted when I tried to produce the articles graph was that while they spoke of "since the start of 1997", the graph started late in 1997. I presume this was to avoid a cold start to the graph, but there may have been other reasons (I just can't think of any though). A couple of years ago, someone forced Phil Jones to concede that there had been no significant warming since 1995, and the "skeptics" made a song and dance about it. I suggest that from now on we just insist that any "no warming since" statement must start in 1995. A fake skeptic is anyone who thinks Christopher Monckton is a member of the house of lords. Cornelius don't forget that UKIPs energy policy is primarily based on the idea that AGW doesn't exist or is minimal. Secondly Monckton is a member of UKIP and is or was their science advisor. So any logic in policy is based on the idea that low carbon energy is not needed. I've been reading Tisdale's ebook which blames recent warming on ENSO. While I disagree with his conclusion and some of his premises (e.g. his claim that back radiation does not really warm the ocean), his description of charging and release of heat is pretty good. Essentially there was a charging of Pacific ocean heat in the 80's and 90's interrupted by El Chichon and Pinatubo that was released in the 1997/98 El Nino. From trough to peak that raised world temperatures by 1C, with a lasting rise of about 0.3C using UAH satellite measurements which measure up in the troposphere and thus show larger swings. That late 1997 peak is an overshoot. It is accepted science that some AGW is stored in the ocean. I think it is also reasonable to assume that ocean heat is released unevenly and can result in large upward swings along with lulls in atmospheric warming especially when measured by satellite which highlights the swings. Found here: Q&A: Professor Phil Jones . The fake skeptics (and I recognise Hank_'s handle and MO from posts at DesmogBlog) never mention that 95% significance level or its significance. If the plane they were about to board had a just less than 95% significant probability of crashing would they continue? Eric (skeptic)- "It is accepted science that some AGW is stored in the ocean"
Some? 93% since the 1960's isn't what I would characterize as some. As for Tisdale, he has some rather unusual ideas about ocean processes. Given that ENSO has probably been around for millions of years, can you summarize how his hypothesis is supposed to work? For the record: George Monbiot has, in the past, pulled David Rose up on his tendency to mislead. Rob, yes, it's more than just "some". I agree with Tisdale that ENSO is not a "cycle" per se, but disagreed that it can cause secular warming before reading his book. When I finish reading it I will try to answer your question. 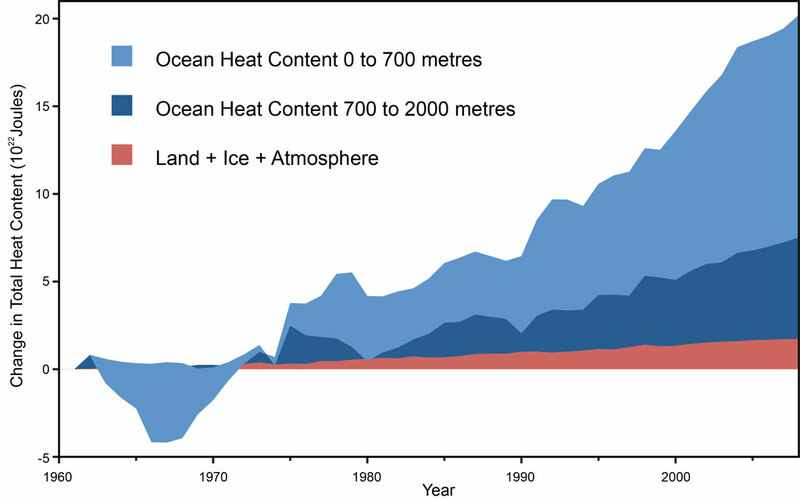 The part that seemed worth mentioning is that ocean heat storage and release is a highly episodic process. IMO AGW simply adds to the storage episode which then adds to the release episode. Storage can span multiple La Ninas, neutrals and even weak El Ninos. "There is a 94% chance that the observed planetary trajectory toward warming is not due to random fluctuation: that it is in fact reflecting genuine global warming. With another year's worth of data to discern long-term signal from short-term noise that figure will increase to greater a than 95% chance that the planet is warming." Moderator Response: [DB] Closed blockquote html tag (H/T to Composer99). The point about Rose is that his errors would seem to be deliberate. It may be that he has been unduly influenced by Monckton, who makes a habit of such behaviour. If they are deliberate errors and seeing as they have the result of hindering action to combat climate change, we can deduce that his intention is to harm his country. I think that there is a word for such behaviour, but I forget what it is. I know it begins with a 'tr' and ends in 'eason' but the rest escapes me. Eric @43 - I'm curious, what does Tisdale propose caused the "charging of Pacific ocean heat in the 80's and 90's"? My problem with Tisdale's argument is that it kind of ignores basic physics. He made a comment the other day that it's misleading to look at global data as measurements of global warming because that leads to the assumption that greenhouse gases are responsible for some warming. I really can't take him seriously after that.